“Earlier this year, I slipped 3 discs in my lower back, being so young (21) I had to be back on my feet fast. Working in the building industry it is essential that my back lasts with minimal injury, Brian was able to completely restructure the way I moved my body at work, how I lifted and moved myself. I was struggling for a few months trying multiple trainers and physiotherapists to help ease the pain, nothing was working with noticeable outcomes. 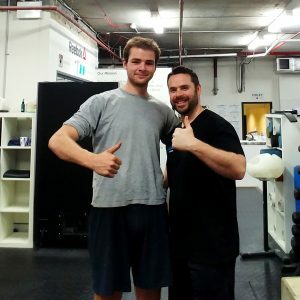 Brian was able to identify the main issues causing my pain within 1 session and sent me home with exercises that had immediate, noticeable benefits. Brian breaks down the issues without making it to complicated; he gives you the ability to identify the issues and the tools to solve them. Brian’s care and attention to detail within every program is what insured a successful outcome. Tailoring each program to work on your weaknesses, while teaching you about what is going on in your body in layman’s terms. Bringing consciousness to my everyday movements and posture, going a long way into easing the over all pain and after 12 weeks I was the strongest and most pain free I had been working ever.